“I’m not retiring,” John Alexander says, just to be clear. The outgoing artistic director of the Pacific Chorale, which he has led for 45 years, is sitting in a local eatery where he is such a regular that the bartender brings him a martini without asking. One of his last rehearsals as the leader of the Chorale has just ended and he seems charged up by it, not tired. Plans and performances are lined up well into the future (including a “Messiah” with Pacific Symphony in December and a Verdi Requiem at Cal State Fullerton next spring). He also wants to teach. “I’ve always been interested in educational issues for conductors,” Alexander says. “One of my heart’s desires is to help choral conductors learn to deal with the symphony.” The two types of conducting, choral and symphonic, require different skills, he explains, and choral conductors aren’t often trained to conduct a symphony orchestra. Through Chorus America, a national support group, he has already given workshops around the country. Now, he plans to do more. 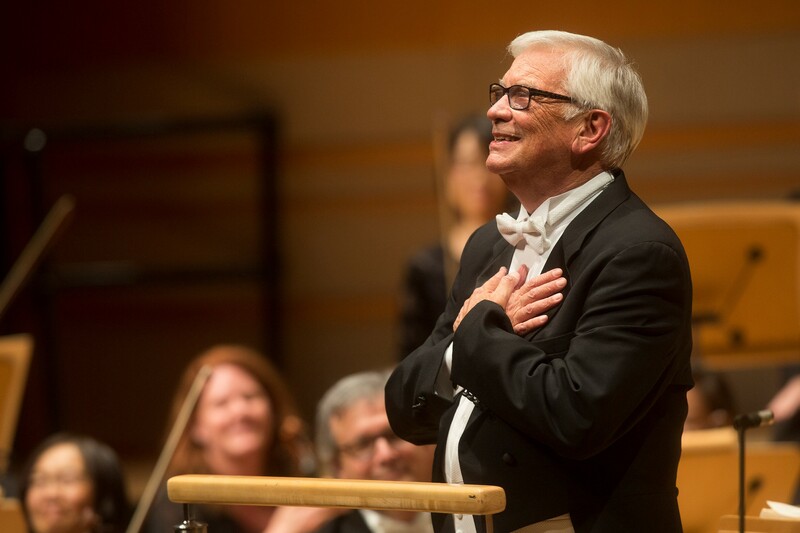 Alexander, 72, closed out his final subscription season with the Chorale last month, leading a performance of Vaughan Williams’ massive “A Sea Symphony,” for chorus, orchestra (the Pacific Symphony), organ and soloists. But he’s got another little assignment left before he’s completely done. 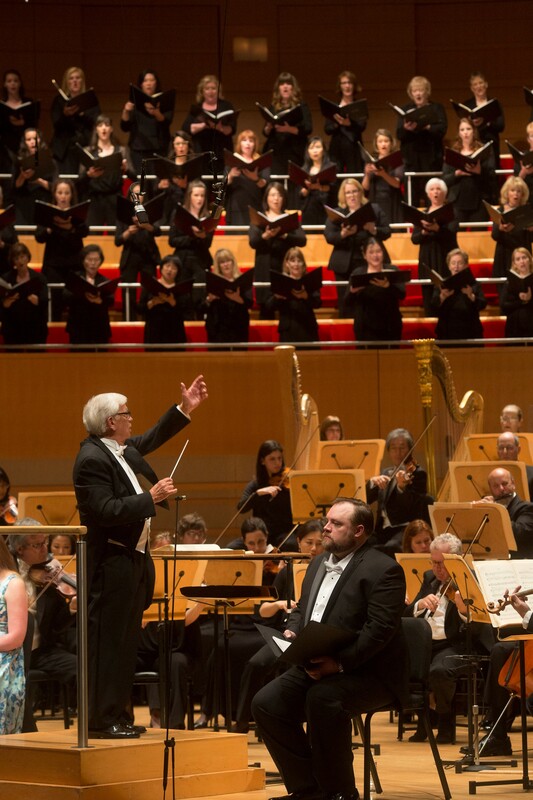 Carl St.Clair has asked him to prepare the Chorale for the Pacific Symphony’s season ending performances of Mahler’s Symphony No. 2, “Resurrection,” with its big choral ending. The orchestra will also offer tribute to Alexander after Saturday’s concert. Watching, and listening to, Alexander rehearse the Chorale in the “Resurrection” on a recent evening, one was struck by his easy authority. He knows what he wants and he knows how to get it. He takes the choir through the music in a particular way, first on the syllable “la” at a mezzo-forte dynamic, then on “oo” and at mezzo-piano. He manicures the phrases chord by chord, fine tuning thirds and fifths, isolating voices and then adding to them. “Singing the chords, I want you to feel the harmony,” he tells the group. Only later does he ask the singers to add the German text; by this time they are more comfortable with the music, able to handle the added challenge. For one tricky passage, when the women come in a beat before the men, he advises the men, only half jokingly, to “draw a trail of blood” in their scores, so as not to come in early. He tells them that Carl hates it when the men come in early there. At the end of the evening, he unleashes the chorale, a triple forte explosion, and no question about it. Alexander has prepared choruses for numerous conductors over the years, including such luminaries as Seiji Ozawa, Pierre Boulez, John Williams, Michael Tilson Thomas, Esa-Pekka Salonen and Gustavo Dudamel. Doing so takes a certain diplomacy as well as skill. You’re handing off the choir to another interpreter, who will no doubt want to do it his or her own way. “The issue preparing is that you have to encourage the choir to be musical, you have to show musical personality in your preparation, but you never show the same musical personality over and over,” he says. “You show a different musical personality every time you approach the phrase.” That way, a choir always has to watch, never settles into a single interpretation, and will be watching the symphonic conductor when the time comes. Looking back on his career, he finds some high points quickly. Early on, his teacher Daniel Lewis gave him the opportunity to conduct the Pasadena Symphony in Brahms’ Requiem. A little later (1979 or ’80), he took the Pacific Chorale and Pacific Symphony up to the Dorothy Chandler Pavilion for a performance of Berlioz’s Requiem, to show the big city, and the folks building the Segerstrom Center for the Arts, what they could do. His proudest accomplishment with the Chorale, though, isn’t one performance. “Here’s my feeling about life at the Pacific Chorale — that it has been a progression that has never gone backwards but just has kept building. That doesn’t mean I didn’t do a lousy performance along the way somewhere. But in general, we never went through a terrible slump artistically and then had to re-invent ourselves or anything.” He says that the choir’s performances this year, of the Vaughan Williams, of Mozart’s Requiem, of Beethoven’s “Missa Solemnis,” have been the best in his career. The excellence of all three of these performances is in no small part due to the participation of the Pacific Symphony, Alexander says. Unlike most choral conductors, who have to work with pick-up orchestras, he’s been able to work with the same players for more than 30 years. The musical relationship is deep. As it is with Carl St.Clair. “Carl and I are wonderful friends, first of all,” Alexander says. “He is a wonderful musical partner. My great respect for Carl is that he takes the time and effort to look inside the composition to find out what it’s about.” The two conductors call each other often to discuss musical matters in the scores they are working on. St.Clair is also unsurpassed among symphonic conductors in the skill with which he handles a choir, Alexander says. The partnership continues with the Mahler this week, and may it continue beyond. This entry was posted in classical music, feature and tagged John Alexander, Pacific Chorale by pacificsymphony. Bookmark the permalink.